Found this old photo recently. 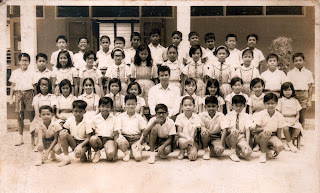 For Standard 2 I was in Gurney Road School II. I'm the one at the front row, kneeling secong from the right. The class teacher I can only remember as Mr Goh. The others name I can remeber for now is Zainon, the fastest girl runner of that time. And also Jaafar, who also happens to be fastest boy runner then. There are quite a few good friends in that class, But their names escape me now. If anybody recognises anyone just let me know. i remember this, don't ask me how..u were infact in std.5 and i was in std.1!! the guy next to you (left in the pic)is syed agil and the girl sitting 4th.from right is zawiyah. i was there from std 2 til std 5..
moved to st john's at std 6..
syed agil and zawiyah were my best buddies..
can you remember anymore names?